Sustainability is a multidisciplinary field that draws from physics, economics and environmental studies. It seeks to improve the well-being of people in all kinds of societies and environments, to improve the economy and to live in a socially just world. Sustainability is one of the fastest growing fields for jobs. It offers many opportunities for mobility with options to work in the public, private and non-profit sectors. Additionally, those who study in the field are trained to tackle complex systems and hard problem solving. Major businesses and cities have sustainability coordinators and teams and are currently under expansions as more research is developed. Many colleges offer classes that are taught in a hands-on format that gets students into the field within their first year of college. Students will take courses involving energy, managing water systems, food production, transportation, the science behind sustainability and much more. 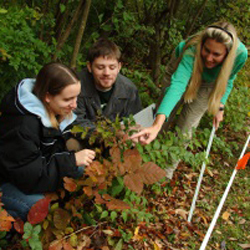 In an example of a classroom experience, students form teams that work together with city planners to design and build a garden in an urban setting. Students would utilize skills in chemistry, social survey of preference, security issues and analyzing who would maintain the final result through organizational skills, personal knowledge and team cooperation. Students who are interested in the field of sustainability should start building a strong background in science. Colleges look for students with strong volunteer work experience, job shadow opportunities and internships in relevant fields. Students should also be able to work well in a team and be able to discuss ideas and problem-solve with others. Encourage students to find programs that allow them to develop team collaboration skills as well as problem solving, presentation skills and leadership. Networking is also important so students should look for campuses that offer a broad network of contacts that can help them gain experience and, eventually, a job. Colleges and universities are places for innovation. Developing ideas in the field of sustainability will grow and develop at the university level with the help of passionate students. Students will use campus opportunities and apply them to future careers where they can make the world a better place.